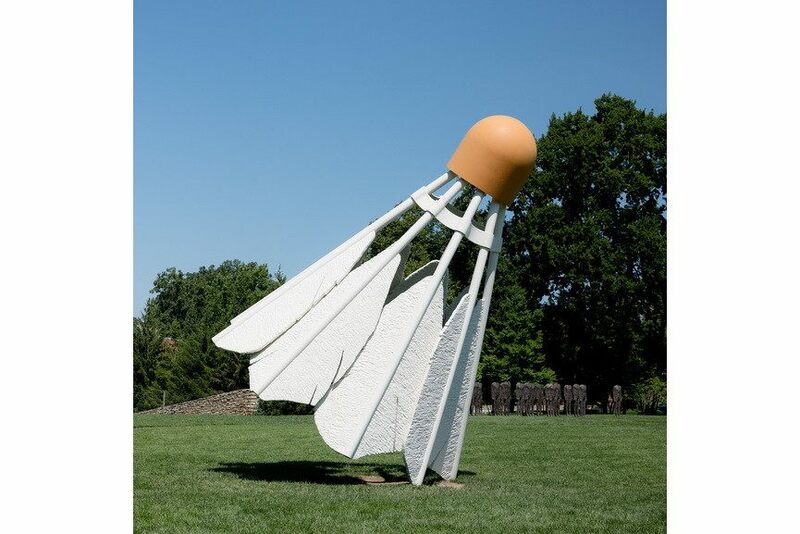 An artist who gained prominence for his large-scale installations in public space, and moreover for being affiliated with the Pop art movement, Claes Oldenburg has made a number of astounding sculptures which are indeed oversized replicas of everyday objects. Most of those works were realized in close collaboration with his spouse, art historian Coosje van Bruggen. The couple started working together during the late 1970s, meaning that they produced monumental sculptures over the course of three decades, until she passed away in 2009. Namely, since the early 1980s, van Bruggen was active as an independent critic and curator; her texts were published in Artforum magazine from 1983 to 1988, and in between 1996 and 1997 she worked as a senior critic in the sculpture department at Yale University School of Art. 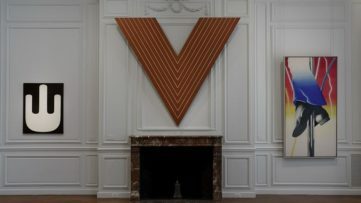 Van Bruggen wrote several books and essays about the work of artists such as Gerhard Richter, John Baldessari, and Bruce Nauman. We selected seven exceptional outdoor sculptures made by Oldenburg and van Bruggen which illustrate their mutual exchange and impeccable sense of public space, humor, and interpretation of the social context. Featured image: Claes Oldenburg and Coosje van Bruggen – Mistos (Match Cover), Barcelona, 1992. Image creative commons. 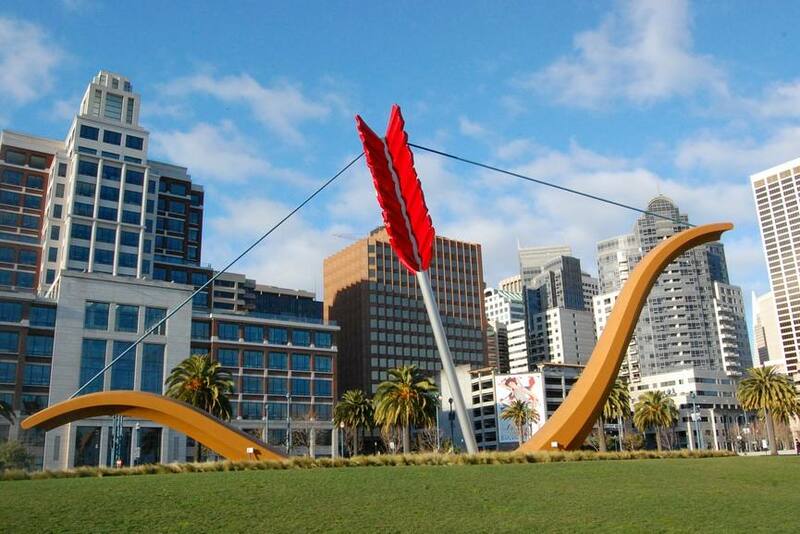 The outstanding Cupid’s Span was installed in 2002 in San Francisco’s Rincon Park. The decision to make the oversized emblem of Cupid was a reaction to the fact this city is indeed the home of liberated sexuality and eros in general. By burying the central part of the bow and the arrow, the couple managed to construct a metaphor of a ship and a suspended bridge, some of the features typical for San Francisco. Featured image: Claes Oldenburg and Coosje van Bruggen – Cupid’s Span, San Francisco, 2002. Image via Flickr. 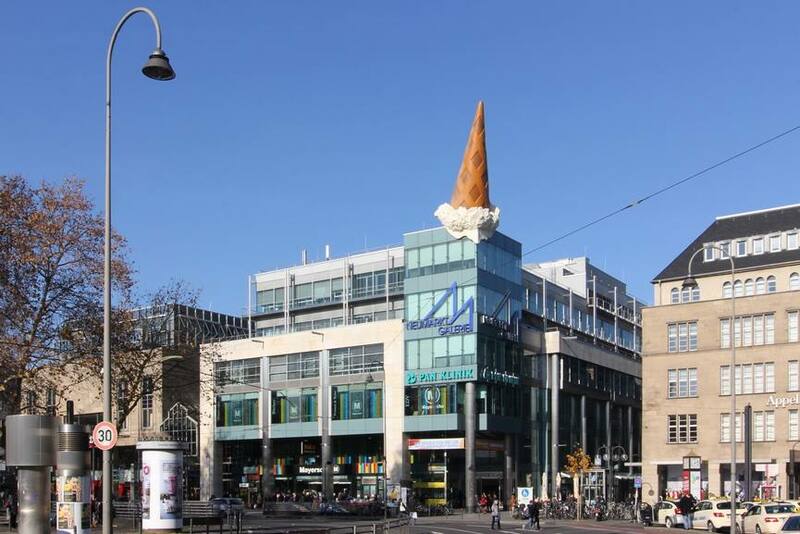 The Dropped Cone piece was commissioned by Neumarkt Galerie and is located in the city of Cologne, where it has been installed since 2001. The pair placed the work on a top of the shopping mall due to the congestion of the surrounding streets. The cone is turned upside down and is reminiscent of the same motif appearing in front of ice cream parlors, typical for Cologne. 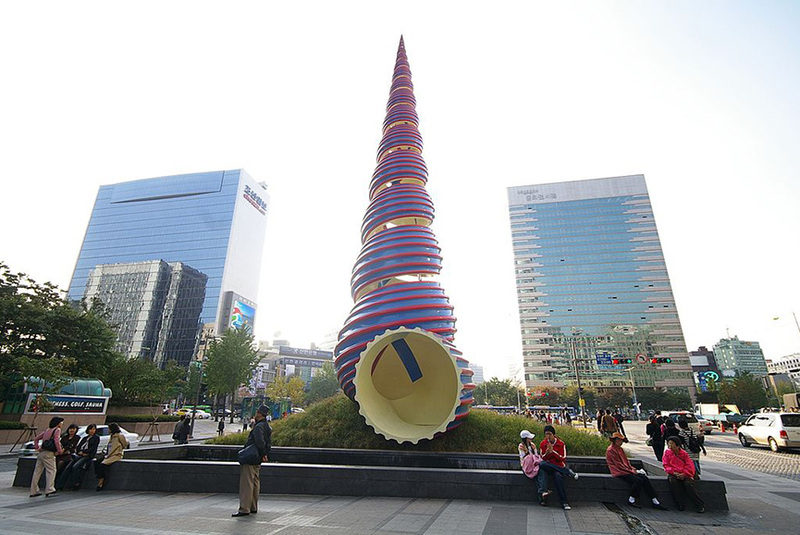 The other reason they chose the cone form is the four letters of the term that can also be found in the city’s name, as well as the artists’ articulation of consumerism. 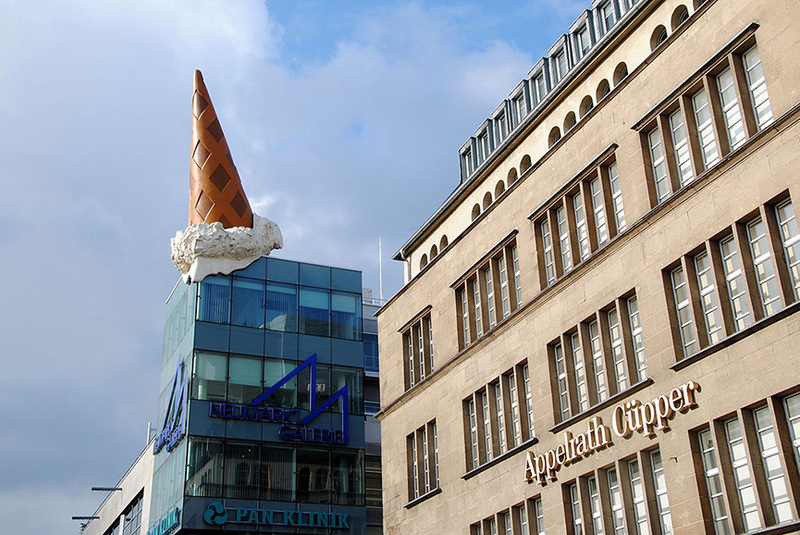 Featured image: Claes Oldenburg and Coosje van Bruggen – Dropped Cone, Cologne, 2001. 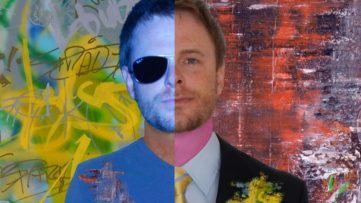 Images creative commons. 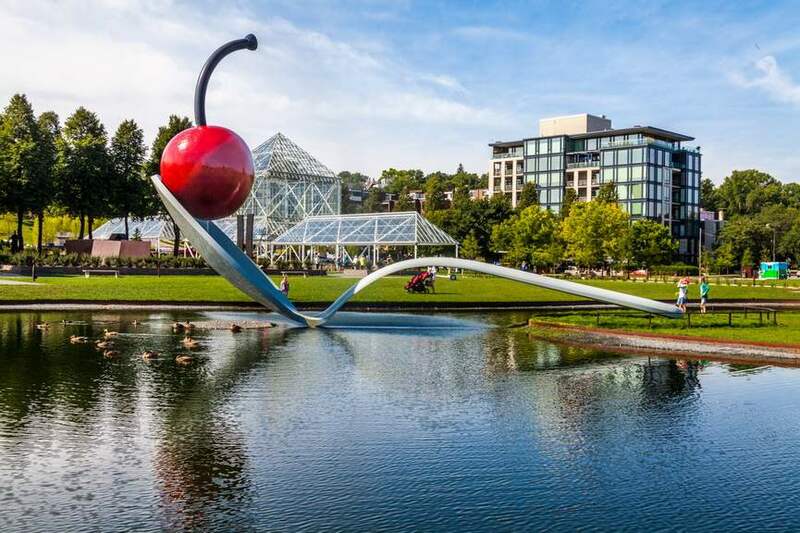 In 1985, the Walker Art Center Commissioned the sculpture Spoonbridge and Cherry for the Minneapolis Sculpture Garden located in front of this institution. Oldenburg and van Bruggen envisaged horizontal elements including the fountain, a constellation which was to not overshadow other sculptures in the garden. The final sculpture of a spoon over water ending in an island is reminiscent of ice-skating, a popular activity during winter time in Minneapolis. In order to break the monotony of the plain sculptural form, the artists added an energizing element – a wooden cherry. Featured image: Claes Oldenburg and Coosje van Bruggen – Spoonbridge and Cherry, Minneapolis, 1988. Image via Flickr. This particular work is the first large-scale project entirely envisaged, designed and instructed by Coosje van Bruggen. Namely, Spring was installed in 2006 in Seoul and was commissioned by the Seoul Foundation of Arts and Culture as part of the Cheong Gye Chon Restoration Project (the urban transformation of a street in the center of Seoul and the conversion of four miles of the river’s banks into a park). 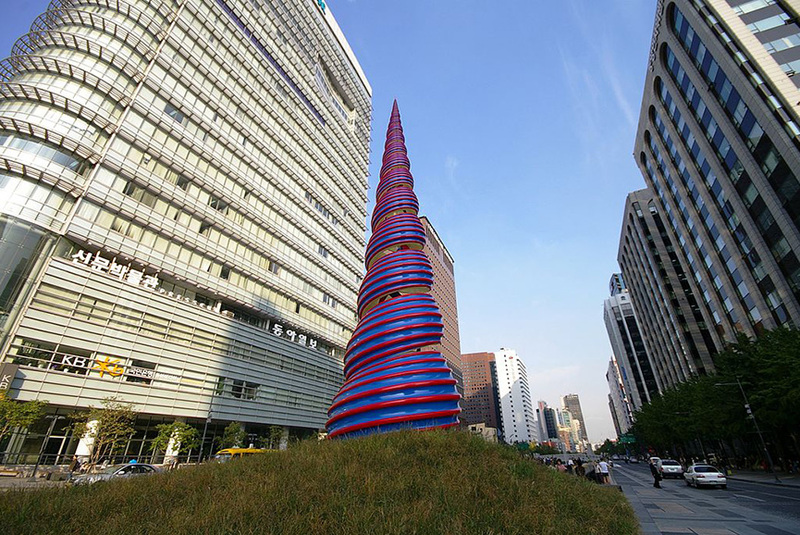 The sculpture takes over the form a small turret sea-shell, and it refers to the double helix of the DNA and the symbolism of the Korean flag. The Los Angeles company MICE Creative engineered the sculpture, which was then produced in Korea by a crew supervised by Professor Bae Jin-Hwan of the Korean National University of the Arts. Spring consists of two hundred pieces of cast aluminum attached to a frame of stainless steel. Featured image: Claes Oldenburg and Coosje van Bruggen – Spring, Seoul, 2006. Image creative commons. 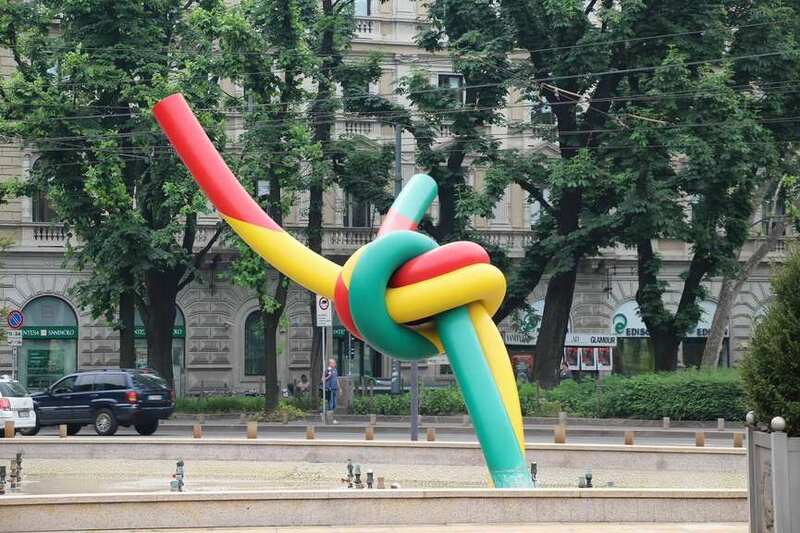 The fifth sculpture on our list, titled Ago, Filo e Nodo, is located in Milan, Italy. 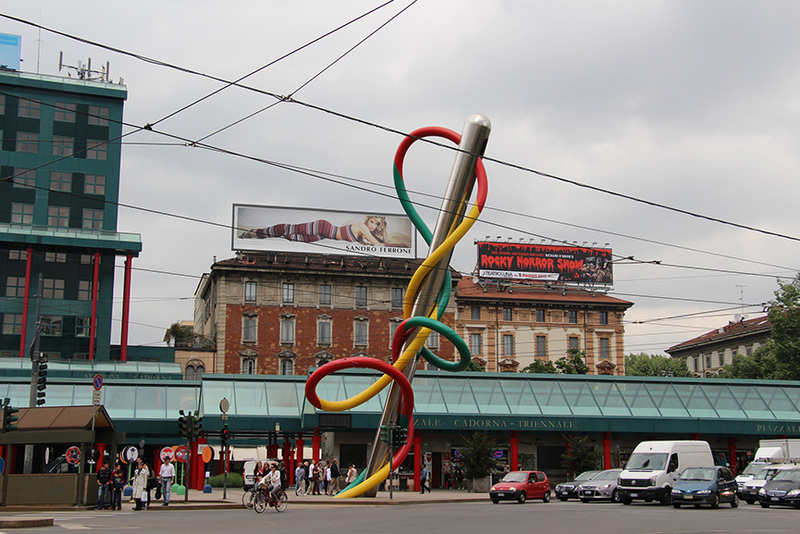 The city commissioned the work in 2000, so the concept of Oldenburg and van Bruggen was based on the metaphor of a train as a needle and thread – the comparison of the similar actions. 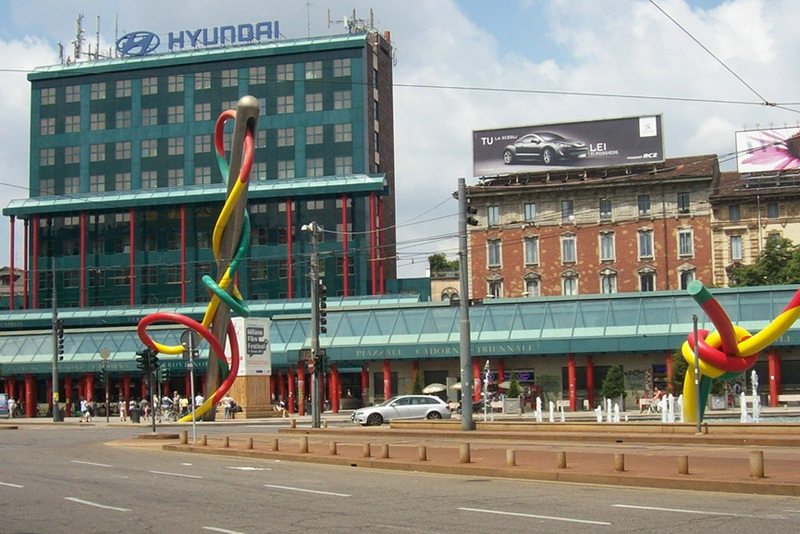 The artists decided to produce an abstract sculpture of the mentioned objects entwined which was a reaction to the local context – the fact that Milan is a leading fashion hub. The other reference was the city’s civic emblem consisting of a serpent rolled around a sword. Featured images: Claes Oldenburg and Coosje van Bruggen – Ago, Filo e Nodo, Milan, 2000. Image via Flickr, Flickr and Wikipedia. The sculpture Mistos (Match Cover) is made of steel, aluminum, fiber-reinforced plastic, painted with polyurethane enamel, and was commissioned in 1989 by Institut Municipal de Promoció Urbanística in Barcelona. It was inaugurated three years later. The initiative to produce this work was part of an extensive urban planning project which eventually became affiliated with the 1992 Olympics. 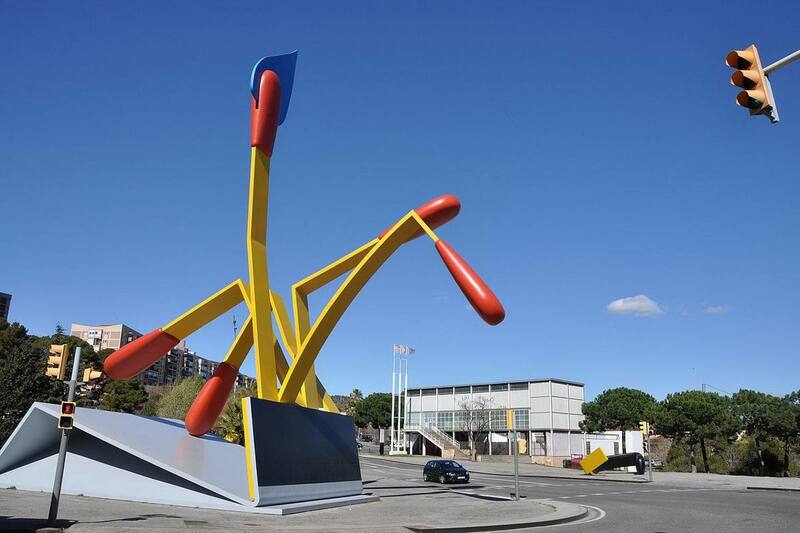 Claes Oldenburg and Coosje van Bruggen choose the residential area Vall d’Hebron as the perfect site to install the sculpture. They proposed a 68-foot-high object reminiscent of a matchbook cover. In order to establish a connection with the local context, Oldenburg and van Bruggen decided to produce the front of the Mistos so it resembles the facade of Antoni Gaudí’s cathedral of the Sagrada Familia. 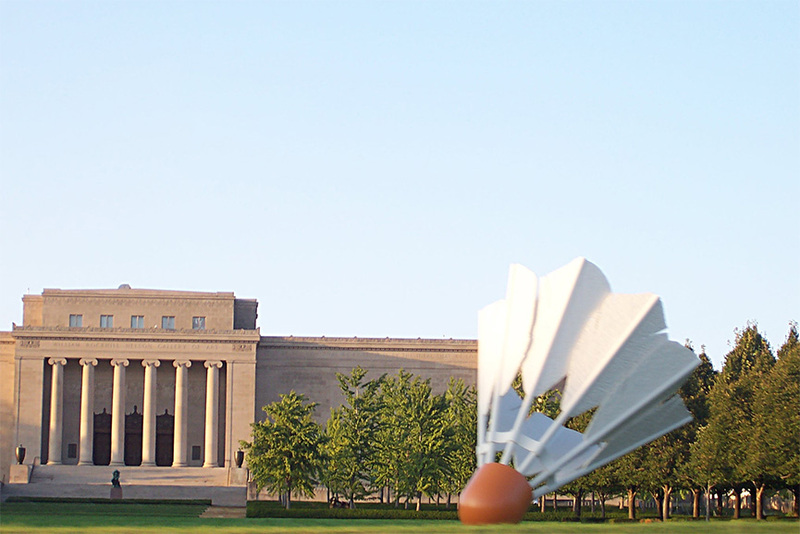 The last sculpture on our list is called Shuttlecocks and it is located in Kansas City. It belongs to the collection of the Nelson-Atkins Museum of Art which commissioned it from Oldenburg and van Bruggen in 1992 and installed it two years later. For the purposes of a large-scale project within the setting of The Nelson-Atkins Museum of Art, the couple decided to transform the lawn that stretches in front of the massive neoclassical facade of the museum. They proposed three shuttlecock sculptures, each in a different position; the inspiration came from the headdresses worn by Native Americans in a painting by Frederic Remington. The sculptures are located strategically in order to bring the far points of the site together. Featured images: Claes Oldenburg and Coosje van Bruggen – Shuttlecocks, Kansas City, 1994 via Flickr and Wikipedia. 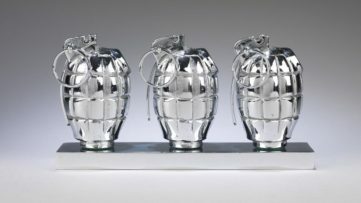 Why Was the 1973 Scull Auction So Important for the Contemporary Art Market?